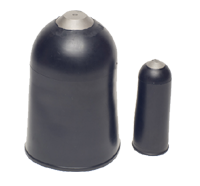 Martin Rubber Corporation has become known world wide as one of the premier companies to go to for hydraulic accumulator bladders. Closed hydraulic accumulator bladders, surge suppressor bladders, and pulsation dampener bladders are very difficult to make, require precise deep draw tooling and assembly fixtures. Martin Rubber Corporation manufactures custom molded rubber bladders and other rubber products to our customers' specifications, including accumulator bladders and an essentially limitless range of other molded rubber bladders. Diaphragm, and open end bladders are used in many gas and fluid storage applications. We have produced many sizes in various rubber molding materials such as Viton, EPDM, silicone, Nitrile, Butyl and epichlorohydrin. Each molded rubber accumulator bladder is precision manufactured to the exact specifications of our customers to ensure correct fit and optimum performance. We have long experience in manufacturing accumulator bladders for customers in the oil field industry and for a wide variety of other applications. Our quality and dependable accumulator bladders can be found in hydraulic accumulators and in pneumatic accumulators across the world. Forming bladder. Making parts to make parts. Composite forming requires pressure to get good structure. A forming bladder in a lay-up mold is used to add pressure and make composite parts stronger. Martin Rubber has all the necessary capabilities to manufacture custom rubber bladders for a vast range of applications, and can take a project from an initial rubber prototype through production tooling. From silicone molded bladders the size of your finger for medical devices, to large forming bladders for composite molding projects, we take pride in taking on challenging and even unusual tasks. Contact Martin Rubber today to find out how our experience and skill in custom rubber molding can produce the rubber bladder you need, with the highest quality, shortest lead time and most individualized attention you'll find anywhere.